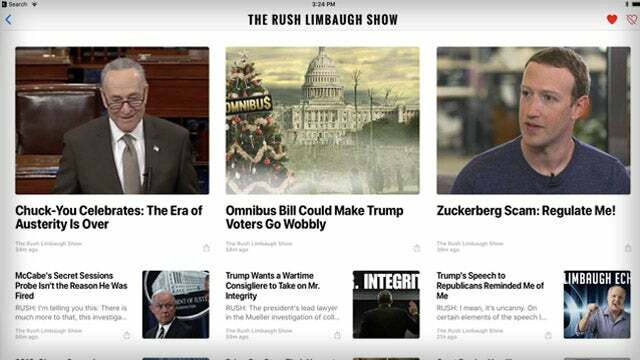 RUSH: Hey, folks, very quickly, we have some upgrades coming in the RushLimbaugh.com app, the iOS and Android app soon. Stand by. Not today, don’t misunderstand, but coming up pretty soon. Also, our website and show content is now available on Apple News. So if you have the Apple News app on your iPhone or iPad, simply go in there and search the Rush Limbaugh Show, and it should pop up, and you’ll be able to favorite it and subscribe to it. Well, not subscribe. Sorry, that’s a different thing. But you’ll be able to subscribe to the free side of what we offer on RushLimbaugh.com on Apple News.